You've seen found footage horror and Nazi zombies before, but Frankenstein's Army mashes them together in a way that breathes new life into tired genre conventions. 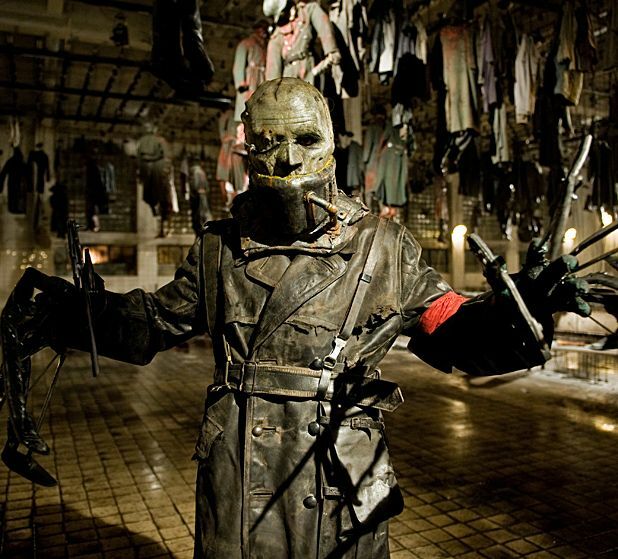 It's based around the wonderfully absurd idea that Victor Frankenstein's grandson (Karel Roden) was hard at work during WWII crafting biological/mechanical monstrosities for Hitler. A squad of Soviet soldiers stumble upon these abominations while on patrol, and soon find themselves deep in a German bunker besieged by a half-human, half-machine army of misbegotten medical experiments. In terms of plot it really is that straightforward; there are a few twists and turns but nothing to trouble the cranium too much. That's not to say Frankenstein's Army is dumb - it just plays to its strengths. The fun is in the carnage and the sheer originality of the creatures: each zombot is distinctly different and wildly inventive, with drills for faces, propellers instead of heads and hands replaced with hooks. It's like a mix of the cantina scene in Star Wars and the freakshow madness of Basket Case 2 (with some added Bad Taste-style gore). This is the debut feature from director Richard Raaphorst and his background as a conceptual artist working on the films of Stuart Gordon (Dagon/Re-Animator) and Brain Yuzna (Faust/Beyond Re-Animator/Rottweiler) has paid off. He displays a fantastic grasp of the notion that visual creativity can provide great entertainment value; every penny of the small budget is visible on screen, with the vast majority spent on the wonderful special effects. To match the World War II setting the cine-camera footage is crackly and jerky, reminiscent of old Pathé newsreels rather than the digitally-captured found footage beloved of Paranormal Activity and its subsequent rip-offs. Despite the energy and obvious knowing winks Raaphorst throws at the audience, a film like Frankenstein's Army obviously won't appeal to everyone - if you squirm at the thought of DIY brain surgery, piles of charred nuns and spilt entrails, you should steer clear. However it should go down a storm as part of the late night Night Moves strand at this year's Edinburgh International Film Festival. Not one, not two, not three but an entire army made up of Frankenstein's monsters. In Eastern Germany in the midst of WWII, no less.